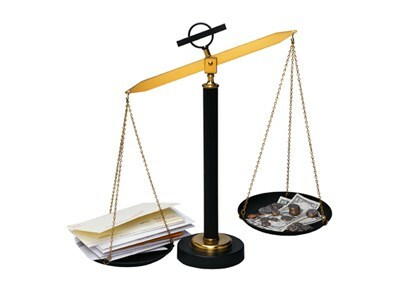 The Money Ways » Managing Money » How Much Are You Worth, I Mean Financially Of Course? Many people measure their worth based on how much money you have. Of course, the amount of money you have has no bearing on how much you, as a person, are worth. Even so, sometimes its fun to calculate how much all of your assets are really worth. And of course, sometimes it’s just painful to do so. If you’re in the right mood to count your money, then here is a crash course in how to calculate what your real net worth is. While many people calculate their net assets by just adding up the value of all their assets and then subtracting their debt, our calculation of net worth takes taxes, selling costs, depreciation and other factors into consideration. These considerations can give you a much better idea of how much your stuff is really worth. Open up a spreadsheet or get a pad of paper and make a list of the following assets. Start by adding up any cash accounts that you have. These include checking, saving, money markets or CD accounts. These values can be listed as is on your net worth calculation. Next, look at your retirement accounts to see which accounts are tax-deferred accounts. You’ll need to make an adjustment for some of the accounts. Any Roth IRAs or Roth 401ks can be added to your list as is, that’s because there will be no income taxes on these when you spend them. Traditional retirement accounts, however, need to be adjusted to take into account the taxes you will have to pay on them during retirment. The tax rate that will apply will be your tax rate during retirement. Estimate what your tax rate will be when you retire. If you don’t know, just assume 20-25% and subtract this amount from your retirement accounts. Now, add this total to your list. Stock accounts are taxable to the extent that you owe capital gains on them. For example, if you own stocks that you paid $100,000 for, but are now worth $200,000, then you will have to pay capital gains taxes on the $100,000 in profit that you haven’t already claimed as capital gains. Assuming these capital gains are long term, the current capital gain rate is 15% for federal plus whatever your state charges. However, capital gains rates are likely to go up again once the current tax cut structure expires. We suggest you take a 30% discount for any unrealized capital gains when determining how much net worth is in your stock accounts. The value of your home is fairly straightforward. If you have a recent appraisal you can use that as a starting value. If not, do a little research as to how much similar houses in your neighborhood have sold for in the past few months. You can also look at sites like zillow.com to get an estimate, but be careful because these automated appraisals are not always accurate. Once you have the value of your home, take another 6% off to cover the cost of selling it. Six percent is the common fee that a realtor charges to sell a house, and you will have to pay that plus some other expenses when you actually sell your house. Therefore, if your home is worth $100,000, you should add $94,000 to your net worth calculation. If you own any investment property or a vacation home, you can also value it in the same method as above. Figure out how much you think it’s worth and then take a 6% haircut to account for the cost of sales. Some people like to be a little more conservative with these estimates, since lots of unforeseen problems can come up with and add costs to your property that in effect reduce your net assets. However, I don’t think that is necessary. If your other real estate is an investment property, then you will also have to pay capital gains taxes when you sell it, so you should make a calculation based on the real estate tax laws in your area. To be conservative, I would knock off 25% of the value of the unrealized capital gains. For example, if you bought an investment condo for $100,000 and it is now worth $200,000, you probably have about $100,000 in capital gains to account for. If you have been depreciating the value of the property for your taxes, you will have even more unrealized capital gains. Figure out the amount that you think you have in unrealized gains and discount that portion by 25%. As I just found out, your vehicles are not worth nearly as much as you think. Plus, they continue to fall in value very quickly. If you want to add the vehicle value to your net worth, I suggest using the wholesale price (the lowest one) from kelley blue book, and then subtracting a few thousand more. That’s because, unless the car is in perfect shape, buyers will want you to throw off money to cover anything and everything (tire wear, scratches and dents, upcoming service costs, etc.). The more your car is worth, the more you should discount it. It’s very difficult to get a good price for a car that is worth more than $20,000. Since cars are deteriorating assets, I would suggest leaving them out of your calculation. You may have some type of life insurance annuity or a pension that you can assign a set dollar amount to for a lump sum payment. You’ll have to know the details of how payouts work before you can add it to your net worth. According to CNNMoney.com, you should divide the lump sum by 1.16 for every five years left before retirement. So, for example, if you have 20 years before retirement and your lump sum is worth $500,000, you would divide it by (1.16)^4, which would mean the current value would be $276,000. I’m not exactly how they came up with the 1.16 valuation, but I’m guessing its a discount factor based on expected inflation and interest rates. In other words, if you are going to get $500,000 in twenty years, that money today would only be worth a portion of the future money. Kind of like how if you win the lottery you can get $1 million over twenty years or a lump sum of $400,000 today. You probably have other assets that you think are worth a lot of money. Jewlery, art, comic books, coins or some other passion that you’ve collected and saved over the years. The amount you should add to your net worth for these should be severely discounted. That’s because, when you actually need to sell these things to make money, you typically have to do it in a hurry and therefore sell for either wholesale prices or for next to nothing. We suggest taking the value that you think your other assets are worth and then subtracting 60% of that value. At this point, you should have a spreadsheet or list of all of you net assets. Add them up and then start totaling your debts. When calculating your debts, it’s pretty easy to do. Look on your recent mortgage, car loan and credit card statements to see how much you owe, or to find the “payoff amount”. These numbers don’t need to be adjusted when making this calcuation. Simply add up all of your debts, including student loans, loans from family, and anything else you owe and total it up. Now, subtract your debts from your total assets and this is your net worth. Let us know, was it higher or lower than you expected? Is Living in a Frugal Way Worth It? Are Paid Online Surveys Worth It? What do you do when your net worth is negative? Do you have an action plan for people who find that they actually owe more than they’re worth? Just wondering if you had something I could offer my readers. Emily Blake recently posted..How Are Forensic Accountants Different From Regular Auditors? There are two types of negative net worth. The first is the kind you get when your house or other assets lose value and you have more debt than assets. You can still pay your bills but you have negative net worth. The second kind happens when you fall on hard times or spend more than you make. In the first case, you still need a plan but it is not as dire as the second scenario. The second scenario requires making lifestyle changes to lower you spending and long term hard work to increase your income. I haven’t written a specific post about this but most posts on our site are a good start in learning how to manage your money better. Thanks for the feedback and I’ll have to think about writing more about this topic after I get my thoughts more organized. Net worth can be very simple for most people: House Valuation less outstanding mortgage plus cash in bank and other cash investments. Your post make me want to buy a house right now but the market price for house has been going up drastically because of speculator who spoil the market. Almost all the good house were up between 30% from their current market price because of this speculator. Hi adding up you financial worth is one thing. But then you have to add up how happy you are. As far as I see everyone wants to be financially secure. But when you get there enjoy it. You only get one chance. So once you have worked hard. Make the most of what you have and don’t get to greedy. I don’t know with the election and four more years, if I really wanted to know where I stood financially. Your assessment, however, gave me sort of a spirit lift. I thought that I was in much worse financial shape than I actually am. There were many things that you included into your assessment that I had not yet thought of. Best yet, it showed me those things that I should focus on going forward. It is hard to know where to invest in these turbulent and uncertain markets. Giving me a fair way to judge where I am coming from gave me a good way to judge where I want to be headed. Thanks! This is some good information thanks. I hadn’t thought about it before but now I’m curious exactly how much I’m worth.